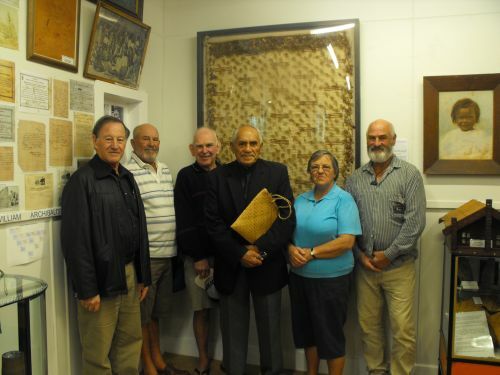 On Sunday afternoon, 15 May, approximately 100 people attended the dedication and opening of Tuakau and District Museum’s new exhibit; a kahu huruhuru (Māori cloak part adorned with feathers). In February 1943 William Archibald Smeed died when his vehicle was hit by a train on the railway crossing at Tuakau. William was a well-respected Tuakau businessman. The Franklin Times reported on 5 February 1943 that William’s body was taken, at the request of local Māori, to the Māori Hostel (now known as Nga Tai E Rua Marae) where a special memorial service was held as a final tribute for the man known to many as The Big White Chief. Among those present was Te Puea Herangi, a noted tribal leader. Te Puea was a close friend of William Smeed and it was at this memorial service that she placed the cloak over his coffin. The cloak was gifted to William’s wife, Christina, and for many years it hung in the hallway of the Smeed family home in Harrisville Road. 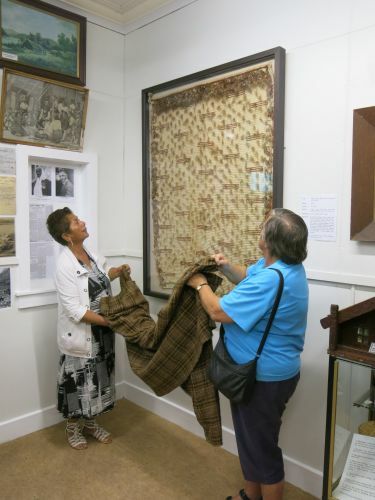 In 2012 William and Christina’s daughter, Shirley Muir, gifted the cloak to Tuakau and District Museum. 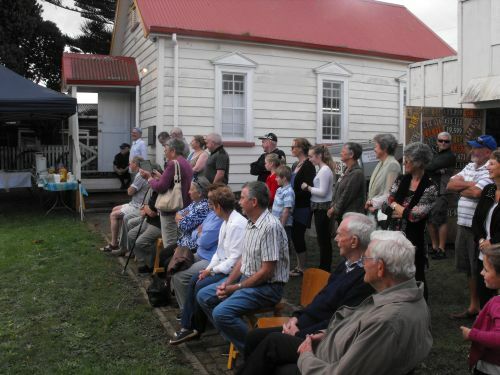 After the dedication led by kaumatua Mara Tupaea, Museum President Keith Brasell welcomed the assembled guests, many of whom are descendants of William Smeed, and introduced one of William’s 12 grandchildren, Robert Johnston, who spoke about William’s working life and the friendship he had with Te Puea. Members of the Onewhero Area School’s kapa haka group then entertained everyone with several items. Two of William Smeed’s great great grandchildren, Ruby and Joe Lorimer, are members of the kapa haka group. Apologies were received from Mayor Allan Sanson, Rangi Te Kanawa (textile conservator at Te Papa) and Sally August (Museum Development Adviser at Te Papa). Rangi and Sally have been instrumental in facilitating the stabilising and framing of this cloak. With formalities over, the guests then enjoyed afternoon tea which was served under a marquee in the Museum grounds. Left to right – Robert Johnston, Ted Muir, Butch Gower, Mara Tupaea, Pam Barber, Rick Muir. Robert, Ted, Butch, Pam and Rick are grandchildren of William Smeed.